Sandra – twelve years old, loves horses. Adam – Sandra’s brother, a year older. Miss Vaughan (Eulalia) – an ex-governess with whom Sandra and Adam are staying. Onkel Anton – a middle-aged man who appears on the scene by accident and causes lots to happen! Mr Mogg/King Mogg – owner of the local holiday riding school, has taken over from the old owners, The Greens. Weary Willie – great nephew of the Moggs, unwanted by the Moggs, he turns to Sandra for comfort. Julian, Harry, Eve, Ethne and Sylvia – the children staying at the riding school. Toby – the vicar’s rather round and stubborn ‘odd-job’ pony whom Sandra is allowed to ride. Sandra and Adam are orphans. Their parents died in a car crash four years prior to the story beginning and they now live with their unsympathetic Uncle Arthur, a rather stuffy man, and their Aunt and cousins, with whom they don’t get along. Their life is far different from that with their parents. Their father was a diplomat and the family lived in many different cities such as Budapest and Vienna, where the children learned to appreciate beauty and culture. Their mother was also an accomplished horsewoman. At the beginning of the story the children have been given a reprieve; this holiday, instead of having to spend it with their relatives at a dreary boarding house by the sea, they have been invited to stay in the country cottage owned by Miss Vaughan, an acquaintance of their Aunt’s. They love it there. Miss Vaughan lets them go where they please. Adam spends his time fishing, and Sandra is even allowed to ride the Vicar’s pony Toby. But they are still blighted by the thought that at the end of their blissful holiday they will have to go back to relatives who are unsympathetic and have nothing in common. Sandra, too, despairs of ever being a good rider. Toby is round and stubborn and she can’t do much with him at all. She has a recurring vague memory of beautiful horses which keeps haunting her and makes her yearn for something more than hairy old Toby. When she sees the local holiday riding school out for their afternoon ride she wishes she could join them and learn to ride properly. But all is not as it seems. Looking closely at the riders, they don’t seem any better riders than Sandra, and the man in charge looks ill-tempered and uninterested in his charges. The children learn from Miss Vaughan that the riding school was once run by the Greens and was a cosy lighthearted holiday school, but it has now been taking over by Mr Mogg, a celebrated horseman, whom the children immediately dub King Mogg. Unfortunately all his energies are concentrated on getting ready the new house and stable block nearby where he is to have his main establishment. He has inherited a few rag-rag pupils who came to the Greens to have fun rather than learn serious equitation and he simply cannot be bothered with them. Then ‘Weary Willie’ then turns up on the scene. He is a small boy who has been foisted off by his mother on Mr Mogg and Mogg’s sister, Willie’s great uncle and aunt. The children catch him trying to pinch a cake and he tells them that Miss Mogg is very stingy with food for both him and the children staying there and they are all hungry. He immediately takes to the sympathetic Sandra who feels sorry for him. She is also sorry for the riders at the stables, no longer envious. She makes a wish that everyone who wants to could learn to ride. Sandra and Adam learn that there is to be another guest at Miss Vaughan’s cottage, a refugee child for whom the kindly woman has promised a holiday. The children set out to the station to collect young Paul but find there has been a mix-up. Paul has been sent to a different address and instead of him is Onkel Anton, a middle-aged Austrian who was a teacher and mentor for the refugees. Everything is sorted out however and Anton stays at the cottage. Sandra is overjoyed to find he loves horses, and has worked with them for many years. She also finds out the secret of the beautiful horses she has been dreaming of. Onkel Anton begins to teach her to ride and under his expert tutelage she begins to make progress and even Toby seems to improve. But then trouble appears. The children at the nearby stables have had enough of their hopeless holiday. Mr Mogg is bad tempered and uninterested in them, and Miss Mogg is mean about food. They can’t go home however, as all their parents are away. They decide to kidnap the horses and lock them in Mogg’s new stables until the Moggs promise them better conditions. Sandra and Adam and Julian, the oldest of the other children think this is a very silly idea. They set off to explore The Heron, the house and stables Mogg is renovating. It turns out to be a beautiful house with a lovely unkempt garden where a small lead heron seems to guard the solitude, a magical ‘secret garden’ type place. Sandra and Adam fall in love with the place and Adam vows to buy it some day. They find out there is a key to the gate hidden under a stone and also a small gap in the hedge where children can slip through. The gates also have locks on the inside, so the brother and sister are at least comforted by the fact that the silly riding school children can lock themselves in away from Mogg’s wrath! I love this book. It has got to be in my top 10 of all time. Why? It is difficult to pinpoint the exact reason. It is one of those books which strike a chord with you and which you can never quite get out of your head. Although Mary Treadgold won the Carnegie Medal for I Couldn’t leave Dinah, this book is just as well-written and it is in fact much more of a pony book than the former. It is perhaps actually the most horsy of all the author’s works which were really more of adventures than pony books (although superior ones) with a little bit of horse story thrown in for good measure. This book is the opposite, a horse story with a little bit of adventure. Normally, with a few exceptions, adventure/mystery type pony books are my least favourite of all. I do prefer books which concentrate on more day to day aspects of riding or on the relationship of rider and pony. However the adventure element in this book does not spoil the story at all. Partly because it is just a very small element, partly because it is done so subtly. When some of the children form a plan which would be taken seriously in many a pony book, Sandra dismisses it as “one of the silliest ideas she’s ever heard of.” And the danger element is in reality not as bad as the children had imagined. Even the most climactic dramatic moment is diminished by the author, who purposely introduces a slightly absurd plot twist which brings everything back down to earth. It is certainly not an adventure along the lines of the Famous Five or even the Pony Patrol! So if you don’t like the adventure type novel please don’t be put off by the fact that there is a small element of it in this one, as it is first and foremost a story about horses and about character. The subject of a girl yearning for a pony is not exactly an original subject for a pony book, but somehow the author raises the subject to a higher level in this book. The spiritual element of Sandra’s love for horses is heightened by the almost mystical quality of the memories which Sandra holds for the horses from those far off days. The half-remembered images are like something out of a dream. We have glimpses of them thoughout the book, memories stirred by images and thoughts. The emotions of sadness, loneliness and desperation are expertly dealt with by the author, without the book becoming depressing. One of the most brilliant bits of writing in the book is when Weary Willie, the unhappy ward of the Moggs, gives Sandra a drawing he has done of himself in which he appears to be doing a Highland Fling. Sandra and Adam realise this drawing is of the internal Willie who is “dancing a Highland fling” inside himself, and Sandra comments that in certain circumstances “you’d have to dance a Highland Fling inside yourself or die” (page 54); in other words you have to keep the desperation and unhappiness in check somehow. All the children in the story are unhappy in different ways, from the guests at the Greens who don’t get enough to eat, to Harry who finds his dream holiday shattered. And each shows their emotion in subtle and understated ways. But we don’t wallow in misery in the book, because as mentioned earlier there is always a little glimmer of hope which threads throughout the story and the characters’ lives. Even though Sandra is often unhappy she does not immerse herself in it, and at time she has odd moments of optimism, as when she sees the picture of the beach with its merry-go-round horses. If we compare this to another pony book author who often explored unhappiness, Christine Pullein-Thompson, we can see that in her books the negative emotions are much more heavy handed, pessimism is over-riding, whereas in Mary Treadgold’s book, there is always the element of hope. And there are many comic moments which also lighten the tone. The children give funny names to people, dubbing Mr. Mogg, The Demon King or King Mogg, Harry becomes Fighter Boy Harry, Ethne is Baby Starlet and another character is Mincey-Wincey Female. The humour is not the laugh out loud sort but is a subtle undercurrent, and relies more on word-play than slapstick. The characters are all brilliantly portrayed, even very minor ones are brough to life with a few apt sentences. As the main character, Sandra is superbly drawn. She manages to be introspective without disappearing into her own navel, as do some characters in less well-written novels. We really care deeply about her without being irritated by her. Also well drawn are Adam, Onkel Anton and Miss Vaughan. Possibly the only weak link in the characters is that of King Mogg, the villain of the piece, but he is not in the book often enough for it to make any great difference. But at the same time the ending is not too trite. The perfection will only last until the end of the holiday. Afterwards, everything will go back to normal. They will be living once more with Uncle Arthur and Sandra will once again be horseless. But through Onkel Anton, and through their own experiences that Summer, both Sandra and Adam have learned that hope can sometimes be rewarded and that dreams can come true. They can re-enter their old lives with that hope still kindling within and with luck they will be rewarded in the end. And are they? You will have to read the sequel to find out! In summary, the standard of writing in the book is head and shoulders above most others in the genre, but at the same time it combines all the elements of the traditional pony novels which we love so much. It also manages to add a slice of excitement and adventure to the mix, for those readers who enjoy such things. It would take a review far longer than I have time or energy for to do justice to the book and explore all its many nuances, so if you haven’t done so already please read it soon! I would rate this book as 5 horseshoes (EXCELLENT) plus a trophy for an outstanding read. I always found that book a real struggle to read. I thought it was dull, and have only ever read it twice. It has even put me off reading We Couldn't Leave Dinah, which is languishing by my desk. a horse story with a little bit of adventure. Which is just my sort of pony book. I thought at first I wasn't going to like it as it does delve into the children's emotions quite a bit but I never found it a depressing read as it focuses more on their dreams and hopes for the future. Interesting to read that this is a favourite of yours, Claire. I agree that it is very well written and explores some quite challenging themes, but it didn't personally grip me. It's impossible to quantify such a personal reaction I guess. I read this at the weekend and it seemed vaguely familiar, so I wonder if I did read it once before. I read The Rum Day of The Vanishing Pony and No Ponies from my school library, but they were not especial favourites, and I don't think I read them more than once. I especially liked the summer country atmosphere and the description of The Heron; it reads as though it was based on a real house. Did you also like Return to the Heron, Claire? Did you also like Return to the Heron, Claire? I did enjoy Return to the Heron but I didnt find it as outstanding as this one. 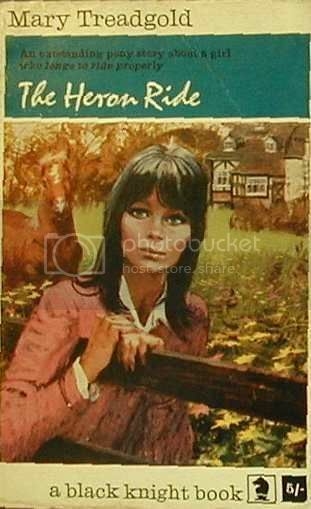 The Heron Ride is a funny one, some people love it, others find it dull, I suspect it only appeals to a certain sort of person, tho not sure what sort! i tried to read this earlier this year (or end of last) and just couldn't do it, your review makes it sound great but in reality I personally struggled before the first chapter was up...maybe it gets better...just pleased to see for once someone else shares my opinion! lol haffy you should know better than to expect to like stuff I give 5 stars to You should read all the stuff I hate! The cover of that one is terrible. Is she supposed to be 12? She looks about 25 & sexually active, hardly a child!